不用滴滴咿改寫吸嘉嘉感覺好帥(ADK) - 程式交易討論區 - COCO研究院 - Powered by Discuz! #define PLUGIN_NAME "FTW-DbfTCdll2" // "?RT data Plug-in" //"Sample AmiBroker Plug-in"
#define VENDOR_NAME "ftw.tw" // "Amibroker.com"
AmiBroker calls GetFunctionTable() from the plug in DLL. 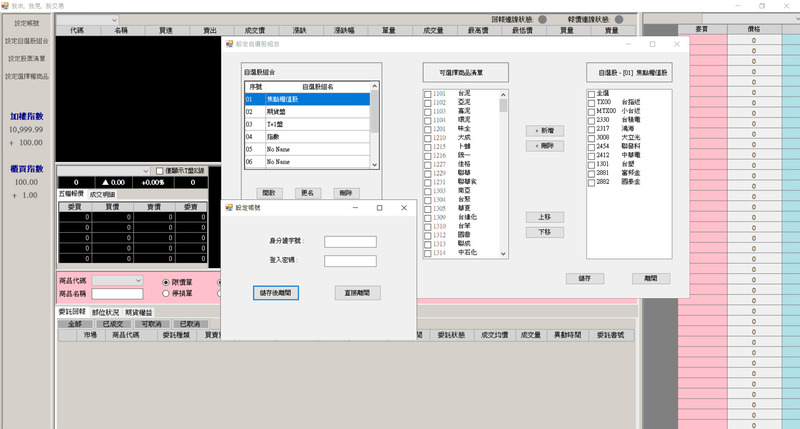 In this step the AFL functions provided by the DLL are added to the internal AmiBroker dispatch tables allowing futher calls of these functions. Note that this is done only once after loading DLLs in the newer versions of AmiBroker (4.10 and up). for the very first time in current AmiBroker session. Then AmiBroker just calls Init() function from the plugin that should be used for initializing working variables/allocating extra memory if necessary. No other function is called for data plugins at this time. GetPluginStatus() function is optional and used mostly by real-time plugins to provide visual feedback on current plugin status. 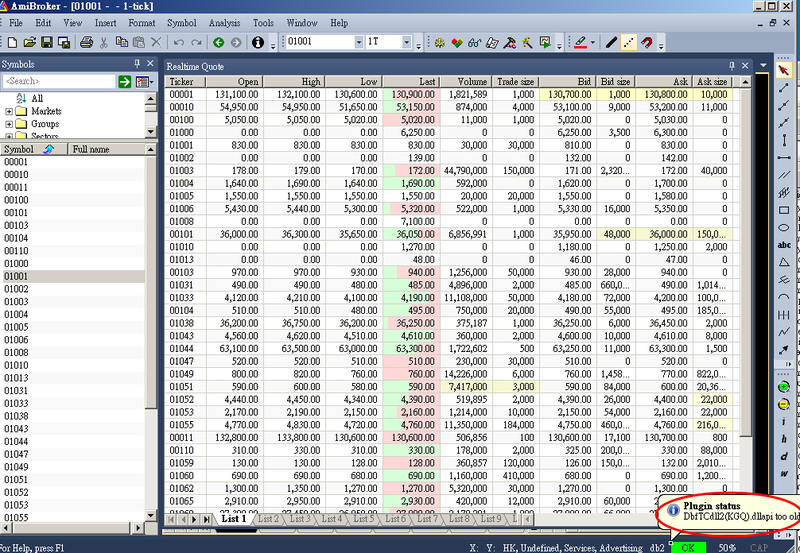 It provides a way to display status information in the AmiBroker's status bar. For example implementation of GetPluginStatus() function please check QuoteTracker plugin source. GetRecentInfo() function is exported only by real-time plugins and provides the information about the most recent trade, bid/ask, days high/low, etc (updated by streaming data). 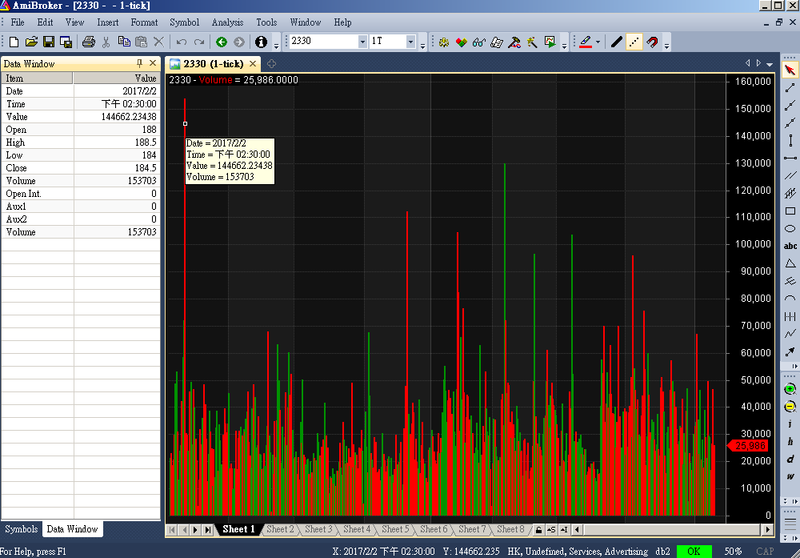 It is called by AmiBroker's real-time quote window on each window refresh (occurs several times a second). The function takes ticker symbol and returns the pointer to RecentInfo structure described above. GetSymbolLimit() function is exported only by real-time plugins. It returns the maximum number of streaming symbols that plugin and/or external data source can handle. 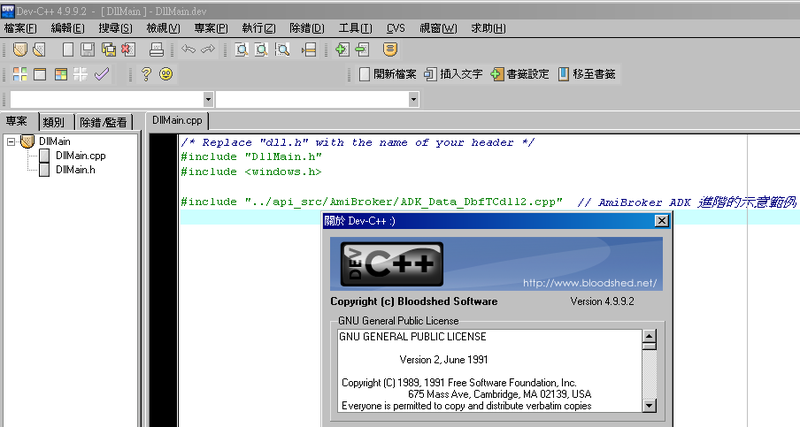 // SiteInterface structure <== 回callAmiBroker的內建函式透過此結構 看.h檔內容 "Plugin.h"
"Dll file "DbfTCdllLibSource" not found! !\n"
// plugin status area of AmiBroker's status bar. // text descriptions of status. // that can be displayed in the real-time quote window. // needs new data for given symbol. // In your DLL you can update the array with more recent quotes.